Diagnostic characteristics of a porphyry copper-gold system have been confirmed in a discovery diamond drill hole at Mongai Creek. A maiden drill core taken from the Mongai Creek prospect owned by precious metals explorer Gold Mountain (ASX: GMN) has displayed visible copper and molybdenite mineralisation and confirmed the diagnostic characteristics of a highly-prospective, potentially large-scale porphyry copper-gold system. 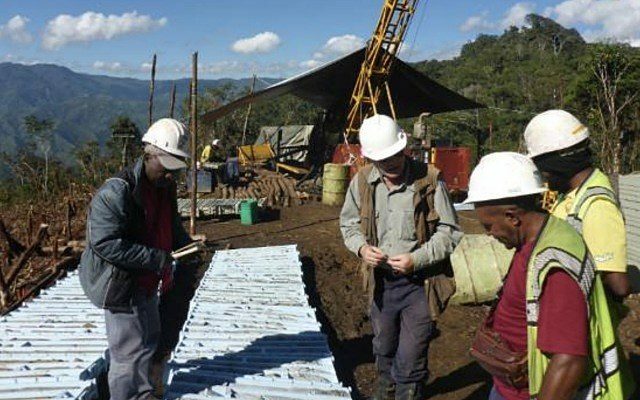 The discovery is the result of an aggressive exploration program at the prospect, located in a gold-endowed region of Papua New Guinea’s Western Highlands just 77 kilometres from the 24 million ounce Porgera mine operated by Barrick Gold. Gold Mountain said the Mongai Creek drill core showed extensive development of stockworked and sheeted quartz-pyrite veins in a microdiorite with minor intervals of porphyritic diorite. Minor chalcopyrite and bornite was also present in some veins. According to Gold Mountain the core exhibits the signature alteration suites of [the region’s] large porphyry systems and in places, comprises earlier potassic alteration overprinted by later stage pyrite-quartz veins with phyllic alteration selvages. The Mongai Creek mineralisation was encountered over an 69.2 metre interval down hole at 279.9m. True widths of intersections are unknown at this stage and the company will not know if grades and mineralised intervals will be of economic importance until assay results are available. Gold Mountain’s recent field investigations have identified additional areas of copper mineralisation (bornite and chalcopyrite) outside the semi-elliptical elevated rim surrounding Mongai Creek. 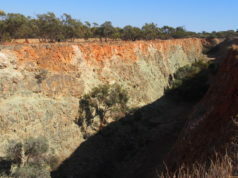 Field work has confirmed abundant alluvial gold in the drainage system of the Mongai Creek valley which contains “extensive diorite-hosted, hydrothermal, quartz-pyrite vein mineralisation associated with a zone of potassic alteration containing minor copper (bornite, chalcopyrites, chalcocite) and molybdenum minerals”. The company said it is “highly probable” the mineralised structures extend to the north-northwest of the present-known extent of the large-scale system. Work is being conducted to sample and map the potential new extensions. Gold Mountain also plans to evaluate field data to identify several follow-up drill targets in the area. Managing director Tony Teng said the large porphyry discovery at Mongai Creek is typical of other large-scale mines in the region. “This significant discovery has a DNA akin to some of the large copper-gold deposits of Papua New Guinea and will be a major turning point for us,” he said. At mid-afternoon trade, Gold Mountain shares were up 10.34% to $0.096.